This article has new content coming soon from Warmind and may not be complete, confirmed, or correct. Please update it as soon as any relevant and accurate material is available. Editors must cite sources for all contributions to this article. Edits that do not follow this standard will be reverted without notice. For more information, see the Citation Policy. "Hear me, o dreadful worm. We will raise an army. We will die and be reborn in your name, feed you the souls of our enemies." Oryx soon learned about his son's activities and was furious. 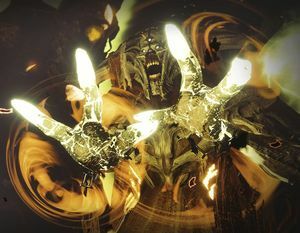 Nokris's actions were sacrilege, and necromancy was considered a heretical violation of the Sword Logic, for it disrupts the means of survival of the fittest. For his crimes, the King of the Hive exiled him and removed all references of his disowned son from the World's Grave and the Books of Sorrow. Only a statue remained. Nokris was unperturbed. In exile he saw freedom and opportunity. He informed Xol that he would conquer the planet Mars in his name. After arriving, the two were met with resistance from the Warmind Rasputin, trapping them within the ice of Hellas Basin. The only reference to Nokris known to the Guardians prior to his awakening on Mars was a statue found in the Dreadnaught near the Altar of Oryx, beside similar statues of Crota and Oryx. The Guardian's Ghost infers it is a Hive god from the accompanying Hive glyphs but couldn't recognize the symbol. At Eris Morn's request Asher Mir scoured his library for references to Nokris but found none..
After the deaths of Oryx and Crota, and the end of the Red War, Nokris and his master were awakened when their entrapping ice began to melt. Together, they sought the destruction of the Warmind Rasputin for their imprisonment and engaged once more with the Warmind. However, interference came in the form of the Guardian working with Ana Bray. Nokris encountered the Guardian during their mission of using a shard of the Traveler as bait to lure Xol and destroy him. However, Nokris faced them instead and fought the Guardian in a fierce battle. Despite his power, Nokris was defeated and his master soon fell to the hands of the Guardian with the aid of Rasputin afterwards. Nokris is the boss of the Strange Terrain mission and is encountered at Xol's feeding grounds. He fights primarily by firing Solar blasts at the player and occasionally summoning Hive to assist him. Every third part of his health, Nokris will break two of the pillars in the arena and retreat to the gate at the front of the battlefield. Nokris will proceed to shield himself in an immune shield and fire rapid Solar blasts at the player. To break the shield, the player must find the large green rock that came out of one of the two pillars Nokris broke, find the green glowing Knight, kill them, and throw the bomb at the pillar to stun Nokris and take down his shield. Nokris at a slightly different angle. The word "Nokris" might be derived from "Noctuidae", which is a family of moth, the wing patterns of which resemble the Shroud of Flies Hunter Cloak pattern. Similarly, "Nokri" is a Hebrew word for "alien" or "adulteress". Relatedly, the prefix "Nok" could be a derivation of "Noc", or "Nocturnal", the Greek Goddess of the night; similarly, the Roman translation is "Nox". Nokris's form greatly resembles that of the Wizard Morph. If he is a Wizard, then he would be the first, and possibly only, male Wizard among the Hive. Unlike his brother and father, Nokris doesn't speak to the Guardians directly. Nokris bears a stronger resemblance to his father Oryx than Crota, who barely resembles him. Nokris's initial Solar attack bears a resemblance to the Acolyte's grenade attack. To date, Nokris and his sect are the only known Hive which have been permanently expunged from the rest of their kin. It's possible that Nokris may still be alive, just like Xol; before fighting the Guardian, Nokris comes through a portal into the area where the fight took place. Due to the portal's similar appearance to the one leading to the throne-world of Hiraks, the Mindbender, it's possible that Nokris has one of his own, and is currently returning to power within it.